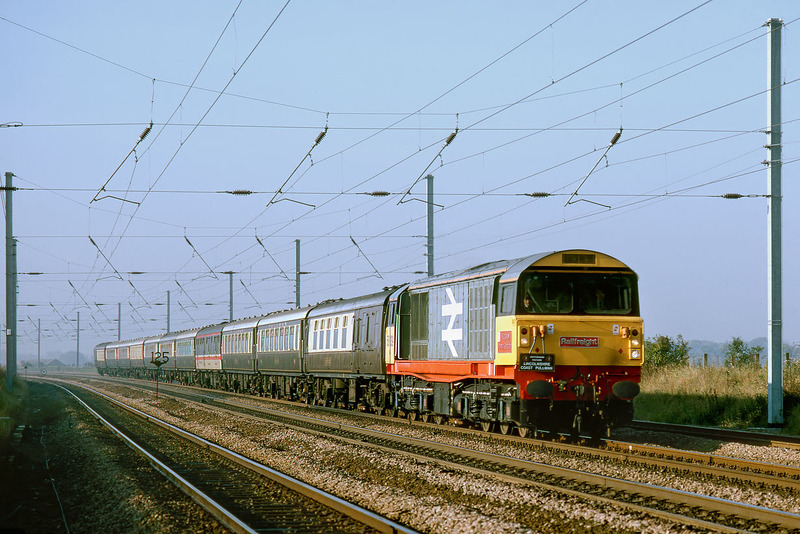 58039 Rugeley Power Station passes Great Paxton on 20 September 1986 with the Hertfordshire Railtours 1G20 Kings Cross to Cleethorpes 'Lincolnshire Coast Pullman' railtour. In addition to Cleethorpes, the train also visited the bracing delights of Skegness. Note the difference in cant between the front and rear of the train as it negotiates the curve. In 1986 this location was easily accessible down a short section of farm track from the main road. However, a gate has subsequently appeared, although the obligatory lineside fencing that has also sprouted up along this section of the East Coast Mainline presumably means that this shot is now either impossible or very difficult.